Published for the American Educational Research Association by Routledge. Foundations Section-Part I is unique among research books. Its three chapters examine common philosophical, epistemological, and ethical issues facing researchers from all traditions, and frames ways of understanding the similarities and differences among traditions. Together they provide a tripartite lens through which to view and compare all research methods. Comprehensive Coverage-Part II (the heart of the book) presents 35 chapters on research design and analysis. Each chapter includes a brief historical overview of the research tradition, examines the questions that it addresses, and presents an example of how the approach can be used. Programs of Research-Part III examines how research programs connected to eight specific lines of inquiry have evolved over time. These chapters examine phenomena such as classroom interaction; language research; issues of race, culture, and difference; policy analysis; program evaluation; student learning; and teacher education. 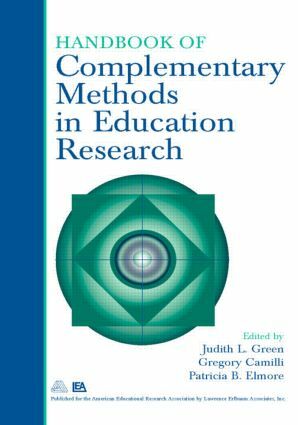 Complementary Methods-As the title suggests, a central mission of this book is to explore the compatibility of different research methods. Which methods can be productively brought together and for what purposes? How and on what scale can they be made compatible and what phenomena are they best suited to explore? Flexibility-The chapters in Parts II and III are largely independent. Therefore, selected portions of the book can be used in courses devoted to specific research methods and perspectives or to particular areas of education. Likewise, established researchers interested in acquiring new techniques or greater expertise in a given methodology will find this an indispensable reference volume. This handbook is appropriate for any of the following audiences: faculty teaching and graduate students studying education research, education researchers and other scholars seeking an accessible overview of state-of-the-art knowledge about specific methods, policy analysts and other professionals needing to better understand research methods, and academic and research libraries serving these audiences.